I'm a writer living in Newtown Sydney. I love travel, coffee, sweet indulgence and finding new things to do with with my husband, son and crazy dog. Check out my blog at lastboardingcallforgate77.wordpress.com for more. 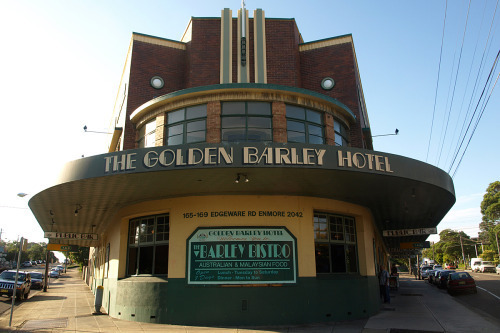 The Golden Barley Hotel has one of the best beer gardens in the inner west. It is a lush oasis in the heart of Enmore, Marrickville and Newtown with green palms, wisteria vines, ferns, market umbrellas and twinkly lights at night. Originally opened in 1939, the exterior retains its beautiful Art Deco architecture. Inside the hotel, there are photographs and original features so even though it has been renovated, it keeps a certain historical charm. Luckily for my brood, it is a 10 minute walk from our house. We often find ourselves gravitating there on a Saturday night for a family night out. The thing I love about the Golden Barley, other than the garden, is the Bistro which is all wooden tables, exposed brick and low pendant lighting which make it feel like a restaurant. A restaurant with a relaxed pub atmosphere and wallet friendly prices, you can have a meal and drink in lovely surrounds without breaking the bank. The Barley has a good children's menu: nuggets; pasta; steak; chicken; burgers; fish and chips. Everything is under $10.00. There are plenty of high chairs for the young ones and 'Little Nippers' activity bags for the bigger kids. To eat, you can either sit indoors at the Bistro or outdoors in the undercover area. The Bistro menu for grownups has a solid offering of burgers, nachos, salad, pasta and steak. There are some great specials and always a dish which features the smoker. There are some delicious share plates and boards such as the Haloumi, Olive and dip 'Barley Board'. Everything is reasonably priced with most of the food between $15.00 and $30.00. The staff at the Barley are always friendly and the counter staff at the Bistro are helpful if you have any questions. The thing that makes the Golden Barley stand out for me is its atmosphere. The times we have been there, it has never felt overcrowded and the atmosphere has always been happy, relaxed and diverse. On the Saturday nights we have visited, there have been 30th, 40th and 50th Birthday parties and a buzzy atmosphere. Saturday and Sunday lunches are more relaxed, with large groups catching up over a meal ( you can reserve a table to ensure your spot). The days always have a nice feel with people lunching, watching sport and mums and dads grabbing a bite with the kids. The Golden Barley is a relaxed family friendly pub with a great beer garden, good food, decent beer (some craft) and some interesting whisky selections. It is the perfect place to go if you are looking to have a bite with friends and family or for your next birthday gathering.